Zendesk is one of the most popular help desk management tools thanks to its extensive features and intuitive experience. 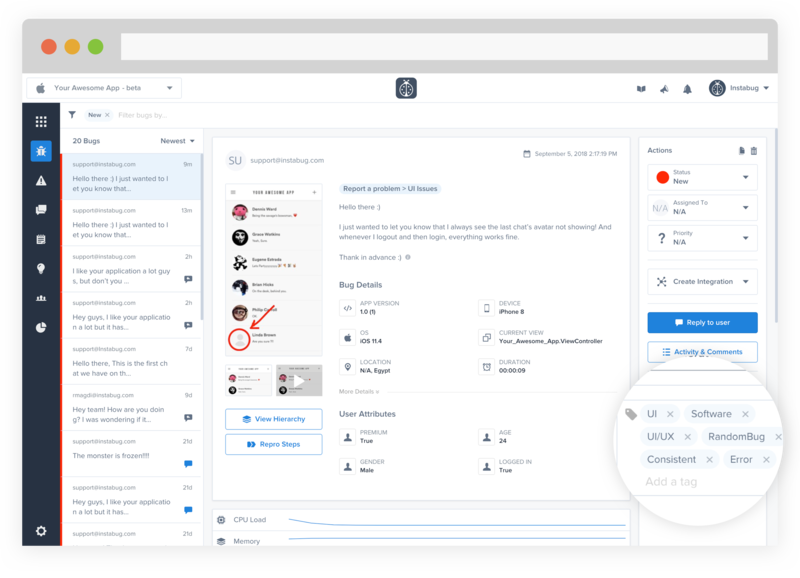 With its ability to collate user feedback from all your channels into one platform, it has made a huge difference in the way support teams work. 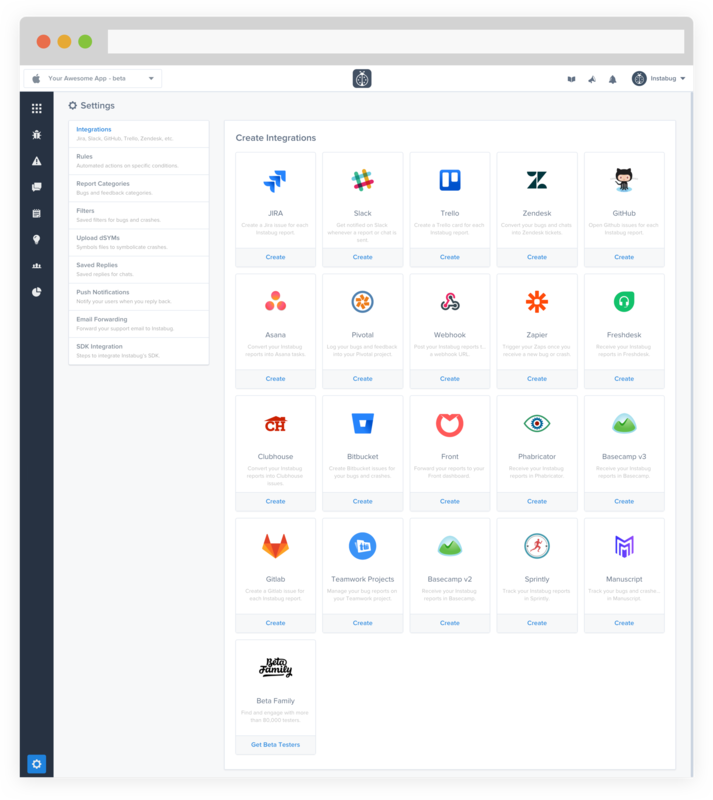 And with the Instabug+Zendesk integration, you can forward your bugs, crashes, and chats to the same platform. This will help your support team become aware of issues earlier and close their tickets faster. Let us first have a quick look at the process of integrating Instabug with Zendesk. The process is very simple and is done with just a few clicks from your Instabug dashboard. Navigate to the Integrations page from the Settings menu in your Instabug dashboard and click on the Zendesk icon. 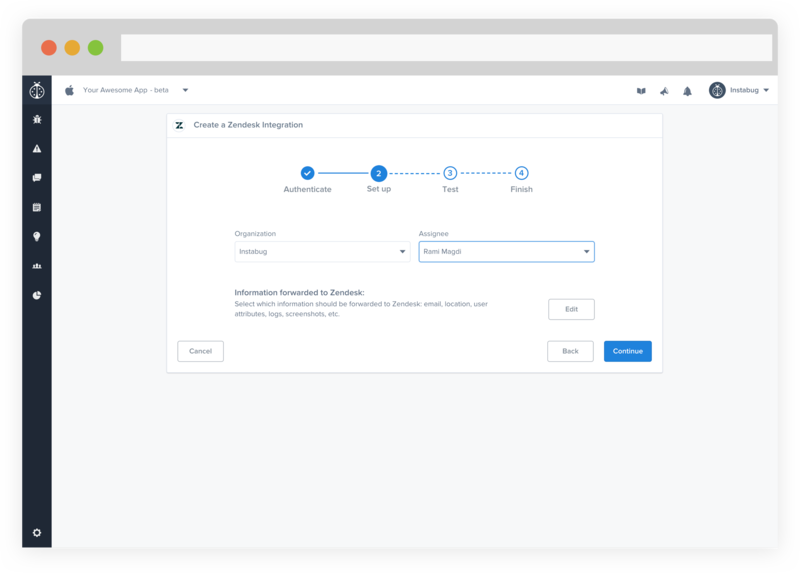 This will take you to the authentication page where you need to enter the host URL of your Zendesk dashboard. 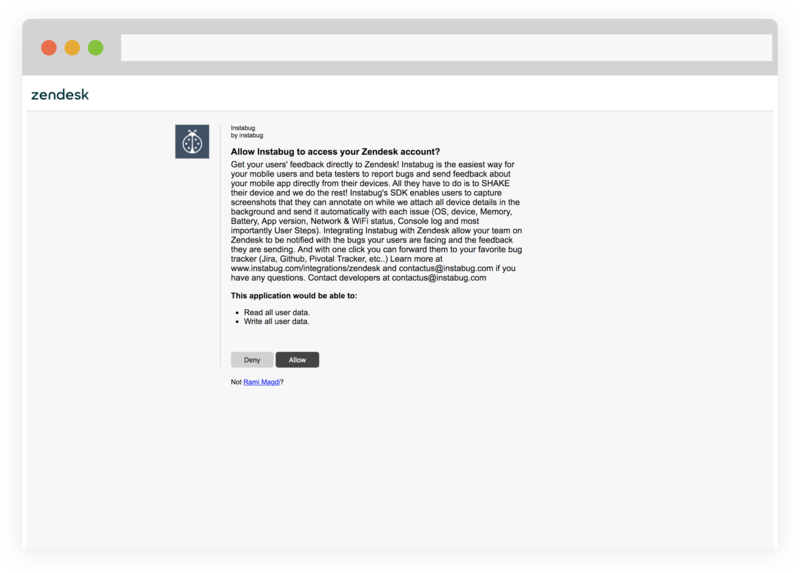 After you click on Authenticate Zendesk, you will be redirected to Zendesk to allow Instabug access to your dashboard. 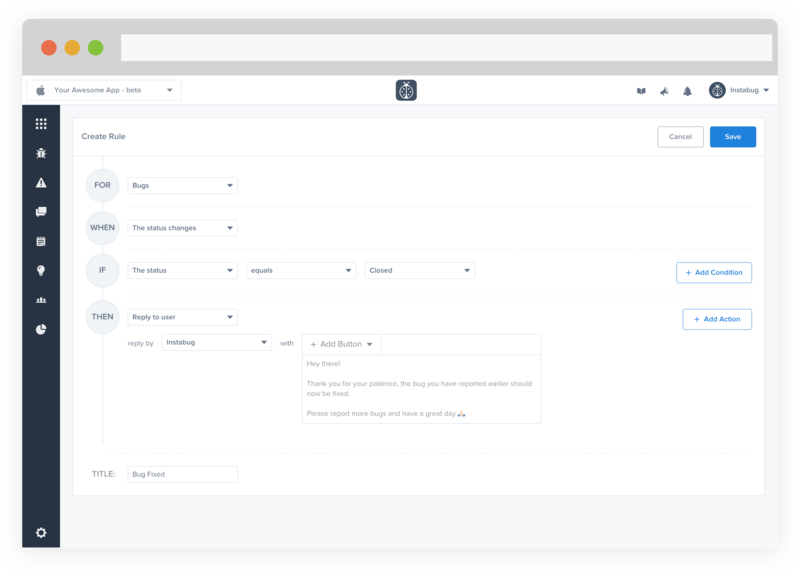 When you click on Allow, you will be directed back to the Instabug dashboard where you can choose the organization and assignee to forward your issues to. You can also choose the information that will be attached to the ticket. Now Instabug will test the integration by sending a sample report to your dashboard. If all goes well you will be taken to the last step of the process. At the final page, you can give your integration a title and enable automatic forwarding for bugs, crashes, and/or chats. Pro Tip: You can set up multiple Zendesk integrations for the same app, each with their own settings. 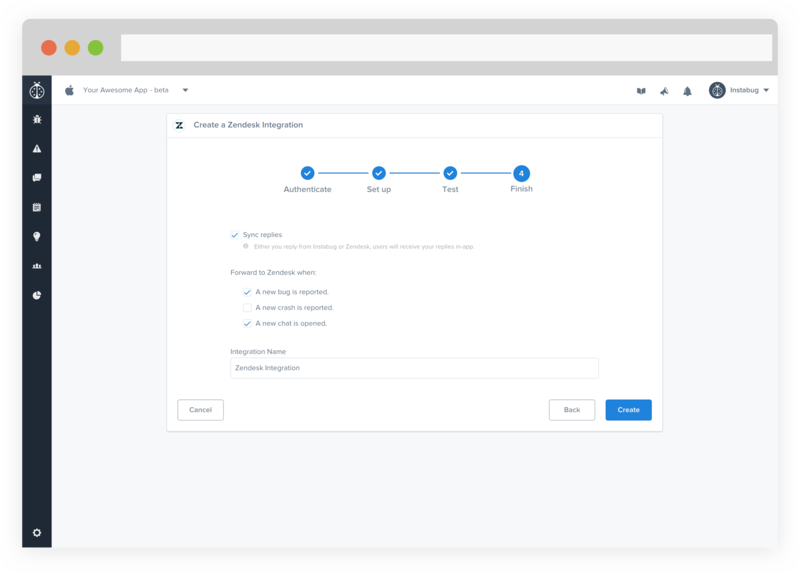 For instance, you can set up a Zendesk integration that forwards bugs and crashes to a specific team member and another that forwards chats to a support agent, and choose the information that is forwarded to each. Just make sure you give your integrations a good name that will help you recognize them later. As the number of your incoming support requests and tickets increase, it becomes increasingly harder to triage and assign them. With Instabug’s Report Categories, Tags, and Rules, you can automate a lot of this process. This will help you make sure your tickets are quickly assigned to the right team member. Report Categories let your users choose the category of the issue they are reporting from a list of choices that you define. This makes it easier for you to decide which assignee a bug should be forwarded to. More importantly, you can use them to set rules that will automatically forward bugs to the relevant and assignee. Report categories are easily configured by navigating to your dashboard and clicking on Report Categories from the Settings menu. There is no need for any code and changes you make to your categories will reflect in your app within 24 hours. Tags can be used to label bug reports so you can quickly decide on the required action. Unlike report categories, tags are added by you or your team, not the end users of your app. Tags can easily be added from the bugs page by typing them in on the sidebar. Another way to add a tag is to enter #your_tag at the end of the bug report while reporting the bug. Your internal testers can use this way to add tags to bugs they report through Instabug. Rules are a great way to automate your bug tracking workflow and eliminate the time consumed by minor tasks. Routine actions like forwarding bugs to GitHub and assigning them to the relevant team member are simple but can be time-consuming. Access the Rules page from your dashboard’s Settings. You can specify certain conditions and the actions that need to be taken when they are met. Report categories and tags can be used as conditions to automatically forward incoming bug reports to the relevant GitHub integration. Prompt replies to your users are a very important part of the customer support process. If you have not enabled answer bot on Zendesk support, your replies are sent as an email to your users. However, replies you send to issues forwarded by Instabug will both send an email and reply to the user in Instabug’s in-app chat. 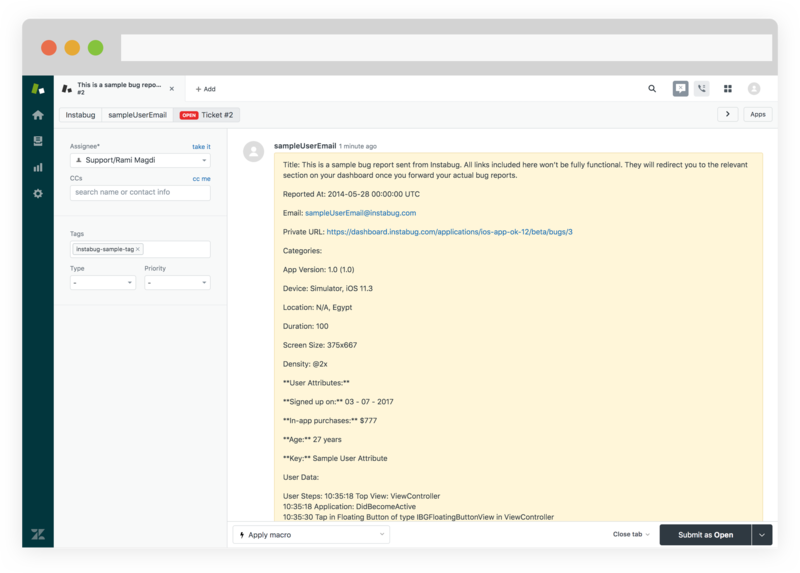 You can set up rules to automatically reply to users with a saved message when they report a bug or when a bug they reported gets fixed on both Instabug and Zendesk. With Instabug however, you can also use the conditions to prompt users to update their app if they are reporting from an older version or configure the conditions for your own scenario. Replying to reporters is available starting from the Team Plan.